Summary: Ruth Jefferson is a labor and delivery nurse at a Connecticut hospital with more than twenty years’ experience. During her shift, Ruth begins a routine checkup on a newborn, only to be told a few minutes later that she’s been reassigned to another patient. The parents are white supremacists and don’t want Ruth, who is African American, to touch their child. The hospital complies with their request, but the next day, the baby goes into cardiac distress while Ruth is alone in the nursery. Does she obey orders or does she intervene? One of my highlights from this year's SIBA was the dinner on Saturday night. 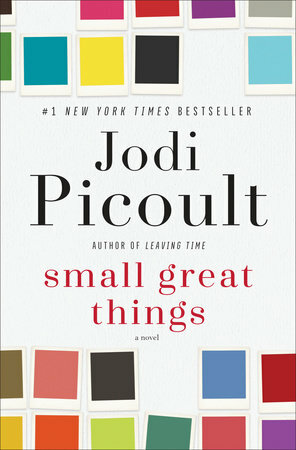 Jodi Picoult was scheduled to speak about her new novel SMALL GREAT THINGS. This book deals with an extremely serious and relevant issue in America today -- race relations and prejudice; and her speech brought the audience to a standing ovation. She didn't hold back on the realities of what she learned while writing this book, and I can guarantee that every single person that was there went home that night and thought about what she said! Most of us have probably read a Jodi Picoult novel, and we know that she's never been one to shy away from controversial topics, but she brings it to a new level with this novel. SMALL GREAT THINGS tells the story of two women -- one white and one black, whose lives are brought together when one is charged with a serious crime. Ruth Jefferson, an African American woman, has been a labor and delivery nurse for over twenty years and is considered by everyone who has worked with her to be an extremely competent. One day, Ruth tends to a newborn only to discover later that the parents, who happen to be white supremacists, have requested that she not touch their child white child. Of course, the hospital complies. However, when the child goes into cardiac arrest and Ruth is alone with the baby, she faces a life or death decision that also could have major ramifications on her own life! Normally, Ruth would immediately begin CPR; however, she hesitates because of the parent's orders. Ruth eventually tries to save the child but it's too late. The parents end up charging her with murder. Kennedy McQuarrie, a white woman who is certain that she's not prejudice, takes her case; and she offers some advice that rubs Ruth the wrong way. Kennedy does not thing Ruth should mention the "race card" during the trial. She's certain that it's not a way to win the case. Ruth and Kennedy both have to learn to trust each other... and it's not easy for either of them. Kennedy learns some valuable lessons about race in our country as well as some meaningful things about her own beliefs, while Ruth is determined to keep her son's life as normal as possible. Can these two women find common ground and save Ruth from going to jail for murder? I enjoyed SMALL GREAT THINGS and I will definitely say that it gave me a great deal to think about. I always say that if a book can teach me something or (even better) make me think, then it's a winner in my mind. SMALL GREAT THINGS is unlike any book about blacks and whites that I've ever read, and I think it's especially important during the current climate in our country. I walked away from this book questioning my own behavior and challenging myself to be a better person, and I suspect that almost every reader will have the exact same reaction. That's all I'm going to say about my reaction to the novel; however, I do want to talk about the story... and what I appreciated. First of all, I loved the set-up -- a black nurse being charged for the murder of a white baby that she was told not to touch. Evidently, Ms. Picoult ripped this plot from the headlines, with some changes; and I thought it was extremely intriguing. The moral dilemma that Ruth faced is almost unimaginable to me, and I thought the Ms. Picoult did it justice in her writing. I also really enjoyed how Ms. Picoult decided to tell this story. She wrote the story from the viewpoints of both Ruth and Kennedy; and I think by writing it this way, she gave additional insight into the characters' and their actions. While I appreciated Ruth's voice and I did understand her feelings, I really enjoyed Kennedy's chapters. As a white woman, I think I could better relate to Kennedy... and I absolutely loved how much she learned about herself throughout the course of the novel. It was in Kennedy's part of the story that I truly began to think about my own behavior. Another important part of SMALL GREAT THINGS was how much insight I got into Ruth's life. By most accounts, she had many achievements. Despite losing her husband at a young age, she had a successful career and lived in a "nice" neighborhood. She also was a single mother of a teenage son who was a really good kid. I wrongly assumed that her life was pretty complete, and I never realized her fears about bringing up a black man in today's society. Even though she worked with and lived with whites, she never really felt accepted... and she exactly fit in with her family either. In many ways, she was living between two worlds. Some of the most poignant scenes in the novel were when Ruth tried to explain to Kennedy how difficult it is being black. There is one scene in particular when Ruth and Kennedy go shopping, and Ruth is treated very differently because she's black. It was an a-ha moment for Kennedy... and me too; and it was a major game-changer for the direction that Kennedy was taking in the trial. Finally, I appreciated that Ms. Picoult also explored the white supremacist side of the novel. It's unbelievable scary for me to think that people like this exist, but I know the reality. Ms. Picoult interviewed many people for this story, including some former white supremacists; and I thought it was extremely interesting to see where they are coming from. As much as I was disgusted by their beliefs, I was glad to see that Ms. Picoult showed that they, too, can change... although I'm not sure that actually happens all that much. Needless to say, SMALL GREAT THINGS would make a fascinating book club pick with the right individuals. It won't be an easy discussion, but it will be an important one, especially in this day and age. There is a reading guide with fourteen thought-provoking questions. Some of the themes you might want to explore include prejudice, race relations, privilege, friendship, family, guilt, change, redemption, self-awareness, and equity vs. equality. Overall, SMALL GREAT THINGS is a powerful novel and one that could possibly change readers' lives. Highly recommended. I received a copy of this novel at the 2016 SIBA Convention. After hearing Picoult speak, I'm anxious to read this book. It sounds very relevant.